The folding bicycle has changed dramatically in recent years. They have made giant strides in their designs and can now rival their full size cousins in many respects. They have a lot of advantages over bigger bikes from a standpoint of storage and portability. And, you don't need a vehicle rack to transport them. A folding bike goes places that no other bike can go. Like a closet, an apartment, a car trunk, an elevator, a bus, a train, a plane, or a office building. You may sacrifice a bit in ride and handling (not as much as you might think) but it makes up for it in storage and convenience. Many urban commuters are finding them much more hassle free way to get around a city. They are very popular in Europe and Asia and catching on, rapidly, in the USA. 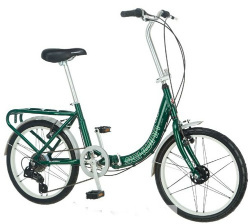 While folding bikes may be smaller, they aren't usually lighter than a conventional full sized bike and, in fact, may be a bit heavier since most use an alloy steel frame for rigidity and incorporate one, or several, hinges. But, they are still easy to carry for most people weighting 25 to 35 lbs. Many folding bikes are available as a full sized bike with a larger frame and 26" tires. They ride and handle like a conventional bike. The bikes with the small frame and wheels are not intended to be ridden off road but the larger framed bikes adapt quite well to the more rugged terrain. And, they have the obvious advantages of easier portability storage. The Montague folding mountain bike shown below has one quick release that lets you fold or unfold in seconds. Your choice depends largely on whether you are intending to use it for multi-mode commuting and need to carry it or are just riding back and forth to work with limited storage space. Return from electric bicycle to choosing a bicycle.